The crew begin disappearing one by one, and are being replaced by aliens who seem to be as confused as the crew is. Who is responsible? Will the crew be able to stop these disappearance before the crew is completely gone? 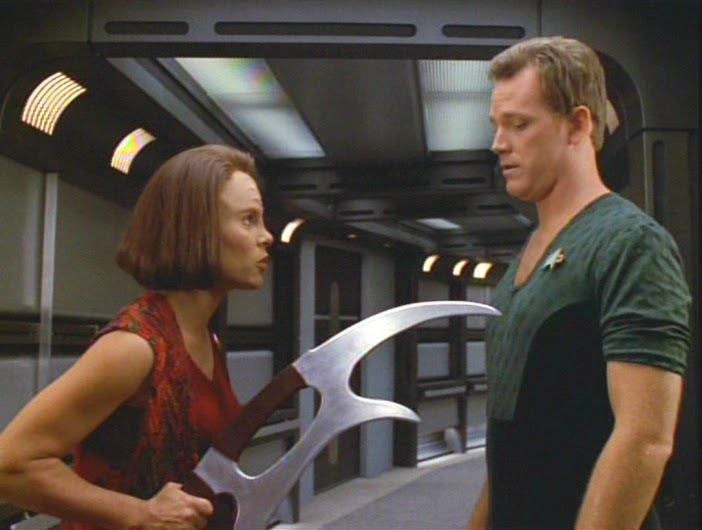 Tommy asks B'Elanna to engage in some knife play. Kevin: This episode feels like a near miss to me. It's not "bad" by any stretch; it just never gels the way it should. The set up is pleasantly straight forward, and for the first twenty minutes builds some good tension. Who's next? Who's responsible? etc. In the plus column, Janeway immediately entertains the possibility the Nyrians are responsible, which is to everyone's credit, but that's where the problems in the episode are revealed. Given that Janeway at least does not dismiss suspecting them from the get go, it makes the eventual reveal that they are responsible less dramatic. I'll take smart and undramatic over forcibly stupid and trying for a forced twist any day, but I'd rather have smart and dramatic if I get a choice. Matthew: "Thoroughly mediocre" is what ran through my mind as the credits rolled. I'm going to compare this episode to "Starship Mine," because both feature hostile take-overs of the hero ship by an alien race. Both are basically "action"shows, with little to no true science fiction elements (that is, elements that really drive the plot beyond providing peril, or illuminate the human condition in some meaningful way). To be successful as Star Trek in my book, an episode like this has to do one of two things, preferably both. It either has to be resoundingly clever as a plot, or it has to use the basics of the plot to illuminate the characters. "Starship Mine" did both. The Remmler Array was a neat timing device, and the characters each got to play out some really interesting scenarios. Here, as you indicate below, Kevin, the Nyrian plot is just sort of a head-scratcher, and outside of a few scenes between Tom and B'Elanna that could have happened in any other episode, we don't really learn anything about the characters. Does it get the job done, and tell a coherent story for 45 minutes? Yes. Does it do anything more? No. That sounds like the definition of mediocrity to me. Kevin: The other problem is that the Nyrians strategy is too complicated by half, maybe even by two-thirds or even three-quarters. If they are really building an empire via this method, wouldn't every local species have a protocol to basically just kill anyone magically appearing in a silly hat on sight? It's really only Voyager who is uniquely situated to be taken over this way. They mention colonies being taken over this way, and that seems ridiculous. Exchanging one person every nine minutes for even a small colony should take long enough that before the numbers game tips, paranoid colonists should, again, just start killing the lone, unarmed Nyrians on sight. It also seems like the resources required to house that many people indefinitely combined with an interstellar transporter should make this kind of subterfuge unnecessary. I like the stab they take at the ethos that capturing is preferable to killing. 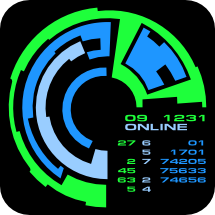 It reminded me of the war-via-video game from "A Taste of Armageddon," and that would have been a fun idea to explore further, but that would have required spending more time with the Nyrians themselves, and not merely glimpses of them as the bad guys. Also, a little nitpick, the scene in Engineering indicates that the selection process can be non-random, so why not start at the top. If they nab Janeway and say, Torres and Tuvok first, that would both seriously demoralize the crew and meaningfully hamstring any efforts to figure out what's going on. Matthew: I think the displacement idea would be a really interesting one with which to tell a story hitting on some of the themes of Israel-Palestine, for instance, in which people try to push others out of a given territory. Here it was just sort of... meh. The thing about ordering bothered me, too. You're going to start with Kes? Really? If there is a complete order, does it not matter what the parson is doing when they're tabbed? What if they're skydiving in the holodeck, will the smash the ground in their new location? Shoudln't a third of the crew be asleep, in their jammies or naked, or in flagrante delicto, or taking a dump? The resources necessary to maintain this habitat thing just took me out of the story. I think there wasn't enough of an ethos given to justify the expense. Kevin: The one bright spot is the interplay between Tom and B'Elanna. They are layering the growing attraction credibly, and it's nice to see Tom's attempts to break down her barriers as a genuine attempt at friendship rather than merely a crass attempt to get her into bed. My one complaint is that the teaser scene is beginning to lay on a little too thickly B'Elanna's antipathy toward her Klingon half. I was watching TNG with some friends recently to introduce them to the Blu-Rays and the topic of Voyager came up, and a friend criticized B'Elanna's characterization in that her "Klingon-ness" is literally always presented as a problem for both the character or the story. Especially after an episode like "Faces," there should be some sense for me that she may not like all of her Klingon side, but at least not be on the verge of a PTSD attack when asked to recreationally engage some its cultural activities. All that aside, the banter is good and the chemistry is undeniable, and that helped keep at least my passing interest in the back half of the episode. Matthew: I don't think B'Elanna's attitude is strange at all. Biracial people in our world frequently struggle with questions of identity, and this can lead to hostility to one part or another of one's makeup. I think this episode does a great job of advancing B'Elanna's character in this respect, and it will bear some tremendous fruit later on. Her interplay with Tom was very natural and a good, organic way of advancing their relationship. I was impressed by the continuity nod of having their holodeck contretemps be a result of a bet made last episode. Kevin: The highlight of this episode is definitely Tom and B'Elanna. In addition to just plain having chemistry, they also spun the quiet vulnerable moments really well. Kind of like the Troi/Riker romance back on the Enterprise, I wasn't overly interested in it when I first watched, but I think that was an artifact of my age. Seeing it again, I appreciate many of the mature notes they hit in developing this relationship. Matthew: Is chemistry a thing, or is it just the result of good acting? Whatever the answer is, Robert Duncan McNeill and Roxann Dawson have chemistry. Their interactions ring so true, in the same way that Frakes and Sirtis made it ring true, but this has the added benefit of tension and frisson. Yes, it's a bit of a cliche when they go from "hate" to "love." But you know what? It's not a cliche that Trek has really mined before (in its sorely checkered history of romantic relationships), and it's a welcome bit of variety here. The actors have just been nailing it time and again, and it's obvious why the writers kept going back to it. Thank goodness the editors didn't hamstring Voyager the way they did TNG. Kevin: Everyone else did fine, though this wasn't exactly Shakespeare we were asking of them. I liked the head Nyrian. She had that right icy detachment to make her feel a bit menacing. It would have been fun to see her and Janeway spar more directly. Matthew: I thought this was another nice showcase for Robert Beltran. This story put him back in the role which he was so good at initially on Voyager (you know, for like 2 episodes), the badass who can think on the fly and change the rules when need be. I saw in another review someone making fun of the acting job of Deborah Levin as Ensign Lang. I couldn't disagree more. That sort of casting (average level of attractiveness, no particular flair or flourish, total naturalism) really draws me into a world - think about your average office. Loads of Average Joes and Janes. I will admit, her stage collapse after being phasered was not among the best. Kevin: The sets on the ship were obvious sets, to the point that it made the crew even briefly entertaining the idea it was real laughable. Those icy caverns were a bit ridiculous, too. They were clearly styrofoam that someone took a saw and some spray paint to. The Nyrian costumes were generic, but I suppose that would almost be purposeful. No one could be dangerous wearing such a bland hat. Matthew: The manufactured habitat was the same old place we've seen a dozen times - maybe even a redress of the tropical program. The Nyrians were really lazy - no makeup, bland robes. The control area of the habitat was pretty basic stuff, too. All told, there is nothing to distinguish this episode, production-wise. Kevin: This is between a two and a three for me. The set up is a little silly and it never really has any tension. We were just marking time until the Nyrians were unmasked and then until they were defeated. Once again, I find myself asking if the character work with Tom and B'Elanna picks up a point, and this time I am saying no. This gets a two. The episode just kind of lies there for me. The character work definitely keeps it far from a one, but it doesn't make it quite to the three for me either. Matthew: I'm in the same place on this episode. It's a reasonably entertaining but wholly uninspiring A plot with a bunch of logical issues. It's redeemed by some nice relationship development. But how far can that go in the estimation of an episode? It's like 10 good minutes and 35 slightly below average ones. All in all, I wouldn't mind skipping those 35 minutes in the future. That pretty much sounds like a textbook 2, which makes our total a 4.